So far we've only printed with PLA filament. 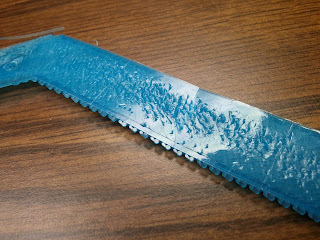 It prints at lower temperatures than ABS, has no odor while printing, and supposedly is stronger than ABS. We've gotten most of our filament from Ultimachine and have printed in red, silver, black, yellow, green, and purple. They all print extremely well, have consistent diameter (~2.85mm) and most stuck to the bed easily. We started off printing straight to our glass bed (it's plain old glass not borosilicate glass). Our hot end was set to 185C - 190C and the bed to 55C (we measured the bed with a thermal gun and got 60C with the software setting of 55C). Things went well for a while but then we started getting curling as we started larger prints. We pulled out the temp gun and the bed was reading all over the place +/- 10C. We turned the bed setting up to 60 - 65C with a little improvement. The silver was giving us some grief not sticking to the bed very well. Example of curling, the right side came up off the bed during printing. Around that time we bought some blue PLA off eBay. It's a great color with a little translucency and it was a lot cheaper than Ultimachine. It has a diameter of ~3.0mm so we had to make a new materials setting in KisSlicer (one for the eBay, one for Ultimachine). We were excited to start printing with our new color but that excitement quickly soured. We could not get the blue to stick to the bed with any consistency. We started playing around with the temperatures and made a little progress but still very inconsistent results. Underside of a print with the eBay PLA. The bumps are were it didn't stick to the bed. Eventually we covered the glass with Kapton tape and that seemed to help out with the blue and it solved most of the problems we had with the silver as well as the curling. Currently we're printing the eBay blue PLA at 210C for the first layer, 190C after that and a bed temp of 75C-80C. Our Ultimachine PLA prints at 185C with a bed temp of 65C. Regardless of the temperatures you end up with, proper cooling is extremely important. 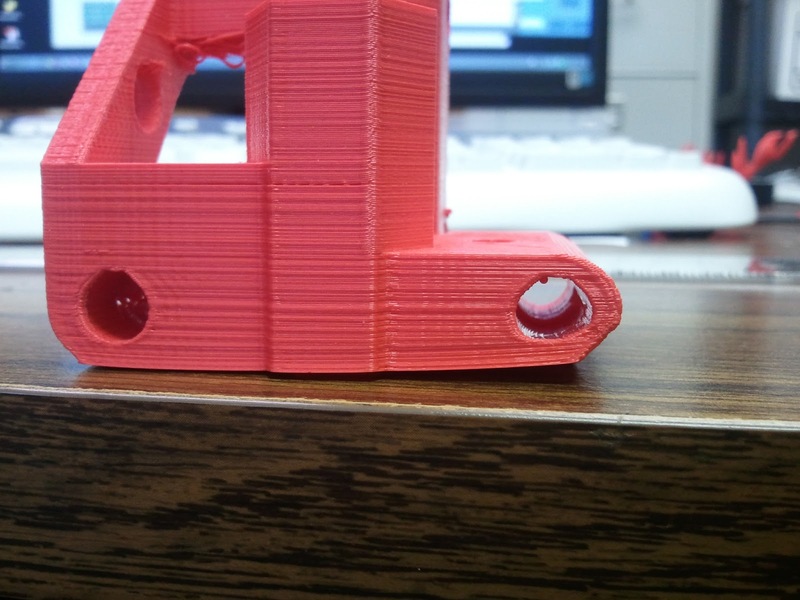 You want the PLA to cool as soon as it's out of the hot end. We have two 40mm fans blowing at the hot end but are still planing to try some fan ducts to focus the air better. I won't say the PLA we got from eBay (which most likely came from China) is bad but it's definitely more fussy than the Ultimachine PLA. If you're just starting off, go with filament you know will print easily, get your printer dialed in, then experiment with the cheap stuff.